Plans to release thousands of sky lanterns on the edge of the Peak District have been abandoned because of the fire risk. Tinder-dry moorland conditions have led to several large wildfires in the area, and authorities raised concerns that the event would spark further blazes. The Lights Fest, which was due to take place at Buxton Raceway at the end of the month has been cancelled by its organisers. Derbyshire Constabulary welcomed the decision. Sergeant Darren Belfield said: “Our concern with this event was that potentially thousands of the paper lanterns could have carried naked flames across the Peak District, with no way of knowing where they would land. “At the very base level, the countryside could have become littered with the remnants of these lanterns. But they also pose a real risk to wildlife and property, and could start fires in a countryside that is already extremely dry due to the hot weather. “The devastation caused with the recent moorland fires shows just how serious fires in the open can be and how quickly they can spread. “We felt this event would have posed an unnecessary risk of fire and so, together with our partner agencies, we looked at ways that we could stop the event from taking place. 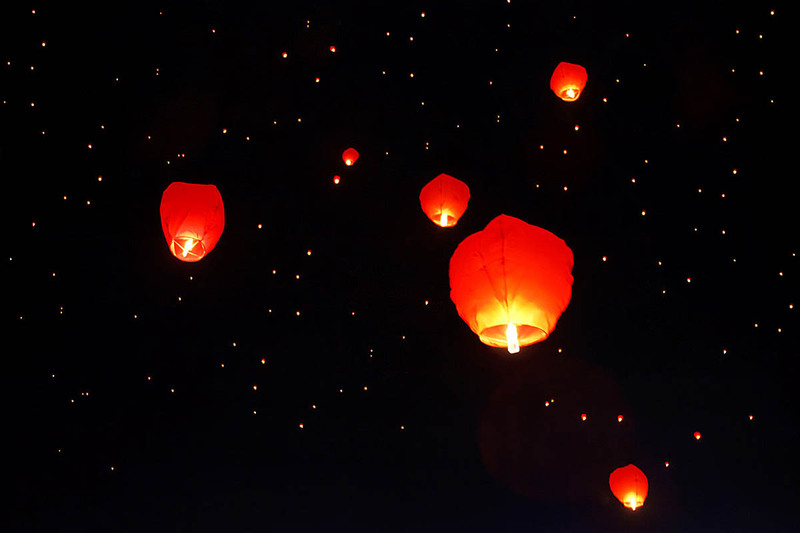 A police spokesperson said a number of organisations and individuals raised concerns about the safety risk posed by the event, due to the fact that the lanterns could land anywhere in the surrounding land and cause fires and potentially injuries to people or animals. For the past few weeks, the Derbyshire Events Safety Advisory Group, which includes Derbyshire police, the fire and rescue service, the county council, and local authorities such as High Peak Borough Council, has been speaking with the event organisers and the owners of Buxton Raceway. The spokesperson said: “With the prolonged hot, dry spell of weather we’ve seen of late, Derbyshire Fire and Rescue Service has been extremely busy throughout this period, with the number of fires in the open attended more than tripling compared with the same time last year. “Add to this the large scale moorland fires that our fire service colleagues have been dealing with in the north of the county and it shows just how stretched the service has been due to the weather causing grass, trees and moorland to be tinder dry. Fire and rescue service group manager Steve Wells said: “We’ve done a lot of prevention work throughout this dry spell and on the back of the moorland fires we are still dealing with to try and reduce the numbers of fires in the open happening. “The increase in outdoor fires we’ve attended over the last couple of weeks and the scale of the ongoing moorland fires highlights just how easily fire can start and spread while everything is so dry. The Peak District National Park Authority had voiced its opposition to the event. It said: “As a national park, we do not support the release of sky lanterns due to the potential impacts on wildlife and livestock. However, our primary concern is now the risk of fire that is increased with the release of thousands of lanterns so close to the Peak District national park boundary. “Although the lanterns are claimed to be biodegradable and with a short burn period, there is no further detail provided on this, and by their very nature, the travel and final location of lanterns remains indiscriminate. The authority recently implemented its Operation FireWatch in collaboration with the Moors for the Future Partnership. Staff from the national park, partner organisations and volunteers are in place at moorland vantage points to look out for fires. “We have put fire risk warning notices at moorland access points to remind everyone of the dangers but we need people enjoying the moors to observe a few basic rules. Firefighters have been tackling an extensive moorland fire in the north-west of the national park, near Stalybridge for two weeks. Some 2,000ha (4,900 acres) of moorland habitat have been destroyed. 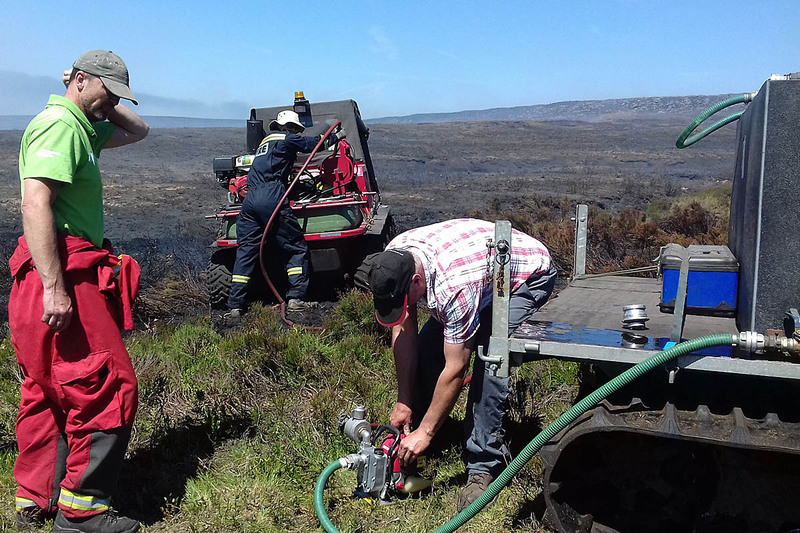 The national park authority has provided staff, vehicles, supplementary equipment, logistics support and local access expertise in the hard to reach places while working with firefighters and other partners and moorland managers. Ms Fowler added: “As we have already seen at Tameside, in these dry conditions moorland fires spread very quickly and are devastating to the landscape, lethal for wildlife and a threat to people and homes. “It’s breeding season for nature at this time of year on the moorlands; we have birds nesting on the ground – plover, curlew and lapwing, insects such as the bilberry bumblebee, mountain hare and other mammals, and reptiles like the tiny common lizard. The fire near Saddleworth is the third moorland fire in the Peak District National Park in 2018. 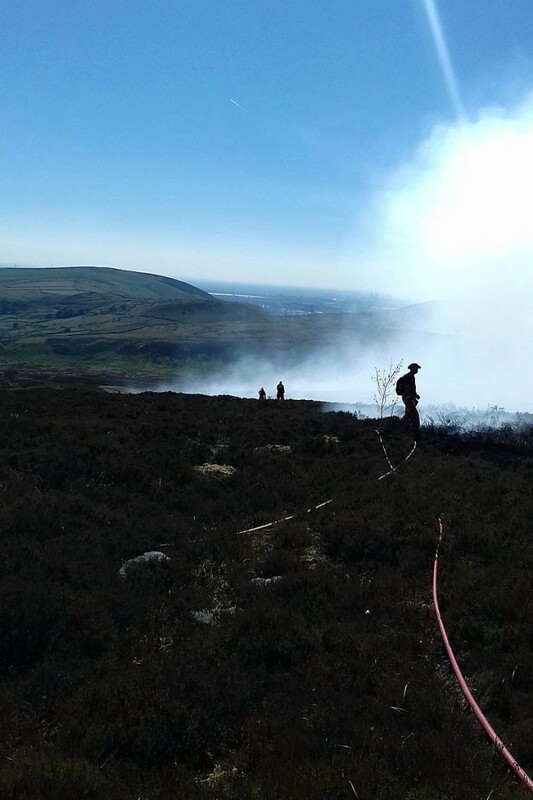 In May, around 40ha (100 acres) of moorland were destroyed at the Goyt Valley and five hectares of moorland were damaged by fire at Big Moor, near Baslow. The authority said it and the Moors for the Future Partnership are working closely together with partners, including moorland owners and managers, to assess the long-term risk of wildfires on the moors as part of a long-term vision for resilient, sustainable moorlands in the national park. It is about time that these Sky Lanterns, (and mass balloon releases too), were banned by law. Such mass releases are at best nothing short of organised littering. They are both, without question, a hazard to wildlife. - And in the case of Sky lanterns, a very real fire hazard too. A few years ago whilst watching New Year celebrations, (a windy night), I watched one of these things, (still lit), roll down the roof of a nearby house. It fell into the garden of that house, and was thus able to be extinguished. Totally correct decision right now. But should be banned full stop. It's nothing but littering on a grand scale anyway. Surely a contender for 'dumb idea of the year' award for even being considered? Good news, ridiculous use of materials and great hazard. Shouldn't take place whatever the weather/ground conditions. Could people who release lanterns or balloons nor be fined for littering? If you drop a bit of rubbish that is an offence punishable by a fine, so surely to let go of an object that will later fall to the ground is no different. Hate to sound like a kill joy, but people need to consider the consequences of their "fun".